Wide area ceiling dome for indoor use only. Ideally situated over isles and tall fixtures for 360 degree reflection area. 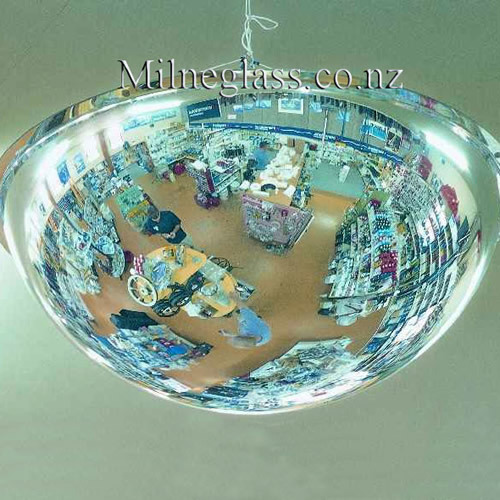 Standard convex mirror suitable for indoors and sheltered outdoor situations. Ideal for retail security and warehouse safety. Heavy Duty convex mirror suitable for outdoor traffic situations and industrial safety. The above is just three examples of the convex security mirrors available, for more information, or if you would like us to come out to inspect your situation and discuss your requirements then please contact us. For a quality product to give you added security and safety then we have a mirror for you.